I've seen the sinks (at last). I was going to call you, but I'm so happy I wanted to put it in writing so that you can share my response on your website: WOW! They are solid and beautiful. I am thrilled that you wrote your best wishes and signed them for me. I will be opening the cabinet and getting my friends to stick their heads in and look for the artist signature! I can't wait to be using them. IF any of your customers are in doubt about the smarter sink option (with the copper grid and the chopping boards, persuade them to reconsider. The walnut chopping board the best I've ever laid eyes on, the wood grain is gorgeous and it is so thick and solid. The polyboard is of equal quality, very sturdy and thick. As is the copper grid. My husband didn't read your unpacking instructions: he pulled at the box with all his might. Fortunately, the grid did not bend; again it is constructed so sturdily that it would take a whole lot of effort to damage it! Last, but not least: Lori, the apron finish is superb. I'm impatient to start using them, and of course I'll send photos. The images of previous customer's sinks helped us when planning our kitchen. About a year ago, I contacted Rachiele for information about their Smart Sinks. Dino took the time not only to enlighten me about his copper sinks, but also to discuss how I would use them, and the kitchen layout in general. I do not believe that there is a more passionate designer and engineer than Dino! He listens carefully to his customers and his products are the result of feedback from the end user. During my design process, I became convinced that I needed two large sinks rather than one wash-up and one bar/prep sink, and I determined that two apron front sinks would do the job (one 36" and one 30"). My kitchen designer was shocked that I would give away so much counter space until he actually saw my Rachiele Apron Front Signature Series Smart Sinks. We leave the solid copper grids on them all the time. Not only are they are useful as extra counter space draining boards / cooling racks, but they are also beautiful. Rachiele works magic with their patinas - you may find yourself wasting time just viewing and reviewing he fabulous options! I was initially worried that I wouldn't be satisfied with the weathered finish I had selected, but my sinks are perfect. I love the sink and faucet! The plumber who installed it was so impressed that he called his business partner to come and take a look at it. It is so easy to clean. I have extremely hard water, and it hasn't water-spotted at all. All of my friends have admired it as well. I also like the wire drainer that I purchased from another company. I place it on the counter when I am washing or rinsing dishes, clean the sink, and then put it back in the sink to let things drain. Your drainer was too large for my small sink. AND, I found a cast-iron teapot that goes great with the sink and granite. (I am a sucker for teapots. You can list me as another satisfied customer. When I was a kid, my father pointed out to me that if you flicked a penny up into the air with your thumb, those minted prior to 1982 would result in a nice "ring". During 1982 however, they changed the composition from mostly copper to mostly zinc - and in doing so, the pennies lost that nice familiar ring. I started collecting copper pennies, and then other copper coins. Soon I began to notice copper roof tiles and gutters on older homes and churches. As an adult, I even noticed that various fixtures throughout my house were copper and brass. So... when it came time to picking a sink for my kitchen renovation, how could I select anything other than copper? After looking just about everywhere, all I could find were flimsy, poorly constructed sinks whose finish appeared an attempt to hide the natural and ever-changing beauty that pure copper develops over time. Thankfully, I discovered Rachiele sinks, and now, after a year, I can say that the wow-factor expressed by visiting friends and family is just as fresh as the day my sink was installed. It is a perfect contribution to the overall design of my kitchen - one that expresses both my personality, and its own personality - as it changes subtly, over time, through gorgeous metallic hues that complement the color scheme throughout the room. When we decided to remodel our kitchen - ended up being the entire front of the house - I went to Houzz for ideas. One of the items I particularly liked was the look of a copper sink. And so the internet search began. I kept finding the same sinks being sold by many different companies and the reviews, when you start digging, were pretty bad - poor quality, didn't fit, etc. I was having some serious doubts about all of it. THEN I found the Rachiele website. It was very informative but being an engineer I also wanted to talk to the company. Dino (the owner) was very patient with me and answered all my questions. I decided to continue my research to make sure copper was what I really wanted and that it would measure up to my criteria - easy to maintain, very durable, won't "date" my kitchen, won't turn green, easy to install, deep and wide enough, made in the USA and of course - pretty. I decided the Rachiele sink was by far the best quality and value I would find. It is nice knowing we were shopping with a small, USA business and not some mystery site on the internet or a big box store, Dino remembered our earlier discussion and helped my finalize our color and size selection. He was spot on about manufacturing and delivery time. I ended up ordering a 33", single bowl, apron front sink with a oil rubbed bronze apron finish and no hammering. Sooo happy we didn't do the hammering. We have gotten tons of complements on the kitchen as a whole but the sink in particular. It really helps take it from the routine/norm to something unique and special. The dark apron of the copper sink ends up pulling the dark colors out of the countertop, the black glazing of the island and the dark hardware. The lighter inside pulls the copper flakes out of the countertop and adds a warmth to the kitchen. I must admit I had to push my husband a bit on this but it was worth the effort. I love the sink. The size is perfect - no problem putting in a roasting pan or extra large cookie sheet. The quality is great - no "tinny" sound that some copper sinks I saw had. It sounds nicely solid. Installation was easy too. 33" sink - 33" cabinet. Had to trim the cabinet face to set it - you would have to do this with any apron sink - but the measurements provided were spot on. The sink edges align perfectly with the cabinet edges. Dino also added a personalized part by signing the bottom of the sink. This was a nice little surprise that just gave it that special touch. Overall - would I buy it again? - DEFINITELY ! The guys at Waterstone were great! I told them what happened and what I needed. Without asking me for date of purchase or even a receipt, they simply asked for my address and sent out the parts. I thought that was pretty refreshing to see a company both take me at my word while keeping their own. Faucet and sink still doing (and looking) great after 2 1/2 years of hard family use. We’ve just completed our 3 ½ month long kitchen remodel and are so happy with the results. Remodeling a kitchen is a big project and doing it ourselves was a challenge but it was worth all the effort in the end. 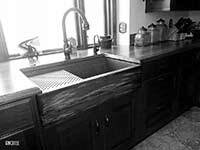 We love our 33” copper under mount sink and the Waterstone faucet suite and think it looks great with our granite. It is such a beautiful element in our kitchen! We previously had a stainless steel double bowl sink which was a constant source of frustration. Baking sheets and large items would not fit into the sink completely and it was so difficult to keep clean and looking good that I vowed to find a better sink when we decided to remodel. After searching the web and finding the Rachiele site, I knew I had found the perfect sink! Working with Dino was great and the sink was just as advertised, truly a thing of beauty! We couldn’t be happier and highly recommend Rachiele products and service. I cannot say enough good things about both your products and your customer service. Our new 33" apron-front copper sink is GORGEOUS. More importantly, though, my husband and I can't get over your incredible 48-hour turnaround time to replace the sink when UPS damaged it in shipping. Your extraordinary efforts paid off and enabled us to get our granite countertops installed just under the wire as our installer was leaving tonight on a 2-week vacation. The kitchen looks beautiful and the sink is absolutely the focal point when you walk in. Thank you, thank you, thank you for helping make a very difficult situation much less stressful. Your customer focus made all the difference. We will send you photos once the kitchen is complete. Betsy Z.
Hi Dino and Gang! I was cleaning out my computer and found these, oops! Forgot to send these in, I think... I have sent you some pics, feel free to use any or all. Both my husband and I are surprised at how much we ended up loving the look of our sink in this kitchen. Not to mention its functionality! It's beautiful, and we have no worries, love the quality! It truly has become the center piece of our home. We used to have a stainless steel sink at our last home. I can't tell you how many times I looked down into that sink, disappointed at all the scratches. This sink sure stands up to the wear and tear from our family of five. I absolutely love that it is always changing it's beauty, this self healing thing is GREAT! I have got to say, I was a little worried about it being such a precise custom size, but you and your team were great, you have got this art mastered. Thank you for your attention to detail, and for your customer service from beginning to end. Dino, often times in the business world we are quick to jump on people when they do something wrong or something isn't up to par but we are very slow to say thank you or express our appreciation when something is done right. I have been delinquent in sending this to you but I am reminded of the need to do so every day when I look at my beautiful sinks. I need to get some photos to you of the finished products and the kitchen install but as beautiful as I think the rest of my kitchen turned out, everyone always comments on the sinks and wants to know where I got them from. Just this morning I gave another person your information. Thanks again for the beautiful and functional sinks. They totally make my kitchen.....and bar.......and pantry.......... George C.
Well indeed the beautiful sink arrived yesterday (Monday about midday as scheduled) via delivery. All without a hitch!!. I fixed up customs last week - thats was about AU$400 a little less than expected. I had the delivery man place it in the carport as I wasn't able to get to it then, not to mention I needed Michael to help lift it. It appears to be in perfect condition, no damage.... I've attached some pictures for you..... pls excuse the mess -- the house is under renovation. The kitchen is not going to be installed till end December now.... I'm waiting on faucets. Once its installed I then do the finish using milk paint. Big job this kitchen.... whew! I will make/keep pics... for you. 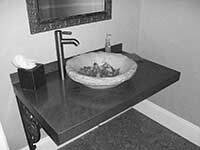 I spent hours looking into a sink including soapstone & cast iron 2 bowl sinks as well as numerous others styles. When I moved into the copper sink option it became a real challenge to determine quality, availability of real copper sinks & style. There are allegedly 'copper' sinks available all over the web/ebay. It was really only when I found your site that I got up to speed on copper sinks..... Your site (once I got to used to traversing it!) is extremely informative. You argue well the case for your real copper sinks by comparisons with & observations of other lesser quality 'copper' sinks on the market....not to mention your certification. Dino, the transaction was a pleasure, despite anxious moments (for me) sorting out customs from this end - a reflection of my inexperience bringing in larger stuff from overseas. Normally one buys smaller items from O/S under $1,000 which means nothing is paid re taxes/GST/tarrifs .... just click, click Order, click click Pay Pal & wait for the item to arrive. All good from this end. Stay tuned... Ive attached some shots of your sink in Australia - in more than one email. My Rachiele Copper Sink Story Wow! It looks gorgeous with my marble counters and Italian cabinets. The customer service is outstanding. Yes, I actually talked to Dino--live. Looking over my notes I had forgotten how many copper sinks I had considered before selecting Rachiele. Maybe Dino doesn’t want me to mention competitors’ sinks, but since they don’t compare to his sinks in quality and price, I don’t think he’ll mind. I had originally selected Native Trails because I saw one in the showroom of the place where I bought my appliances. Then I looked at Brass Elegans, Signature Hardware, Highpoint Collection, Copper Sinks Store and many others. I remember I was very concerned about the color. I did not want a shiny copper-penny color; I wanted a darker bronze shade (color of an old penny). Since I talked to Dino via Live Chat, he sent me a link, while we were talking, to show me the exact color. The color was exactly what I wanted and when my sink arrived, it was exactly the color of the sink in link he had provided. Choosing Rachiele among all the available copper kitchen sinks was easy: it was the only sink that had the drain in the corner. As a person who cooks a lot there is nothing worse than putting your colander in sink with the drain hole in the middle and having all the water back up onto your pasta. Also if you don’t have the drain in the corner, you are almost forced to buy a grate insert to sit on your sink in order to elevate the pans and dishes so the water can drain. I prefer simple, elegant solutions to problems and the corner drain is both simple and elegant and it works. Since I was buying the copper sink for its anti-microbial quality, I wanted to make certain that the copper purity and content was as represented. I felt much more comfortable buying a sink that was manufactured in the U.S. rather than someplace like China where the factories take a lot of shortcuts and don’t necessarily follow the specifications they are given, ergo the cheaper prices. Would I buy another sink from Dino? Yes, most definitely. I am going to be remodeling another kitchen and a Rachiele cooper sink is at the top of my list for that house. Dino, I love the picture you sent of my sink! I am so excited that I got "my way"!!! I have been driving John (husband), our project manager and the factory absolutely crazy complaining about the sink they planned on installing. I am quite sure I have confirmed their thoughts that I am beyond spoiled getting my way! Like I told John, I was not about to give up on finding a sink until I knew I was positively beaten. I am so fortunate that your website popped up when it did. My life on that boat would be miserable if I had been stuck with that small, unusable sink that was scheduled to be installed. I just can't tell you enough how thrilled I am with your sink. It is beautiful ! You went way overboard with the packing—unbelievable! We have shipped the engines and other big ticket items to NZ for this boat and nothing had the packing and protection that you have done for the sink, let alone putting a monitor on the box! Chances of us being in Florida waters are quite good as we have friends that cruise the East Coast. We will definitely give you a call. When we take possession of the boat, (July ? )and soon as we have it all nice and tidy, I'll send you a picture of the sink installation. Wow! Elegant! Beautiful, if a sink can have beauty. We're all the comments that our house guest said when they saw our sink. After total reconstruction of our kitchen, in just four weeks, my wife and I opened our house for a grand baby shower. When we first decided to redo our kitchen, one of the first decision we both agree upon was that we wanted a copper sink. You are right we looked at all the competition and once I compared them I realized they just didn't compete with the products you offer. Not only the good looks, strong structural integrity and built in common sense of a right/left hand drain but when matched with the Waterstone faucet suite we now have a masterpiece within our kitchen. I must also admit that I purchased the drainage rack even tho my wife didn't see the need. However, once installed and in daily use she now admits it was a valuable and useful addition. So, I close with a big Thank You for a wonderful American made product that we are very proud to own and enjoy its use every day. I bought two bathroom sinks from you over a year ago and I love them! They are bullet-proof. They are 100% maintenance free. I also purchased the teak oil, but can't remember what that is for. Can you advise me on this? Thanks for such an amazing and beautiful product. My wife and I are done with our kitchen renovation (with your sink as the centerpiece and focal point) and I wanted to take a moment to thank you for the excellent service you provided. The quality of your product is without equal and the manner in which you facilitated the transaction is an example for every other small business to emulate. For that my wife and I thank you. It was a pleasure to do business with you and we feel that we received a great value for our investment. Attached are a few pictures we took along the way. Should you find any of them useful please feel free to use them on your website and in any other marketing material. It's pretty much an [unintentional] advertisement for your sinks. If there is anything in the video that is of value to you in helping educate future customers please use it in any way you find beneficial. Should any of the attached photos be of use to you please make use of them as you see fit as well. Hopefully they can help you procure even more business. You deserve it. People who appreciate quality but don't necessarily know where to go to find it will benefit from anything that will get them pointed to your site. Had it not been for your website and the videos you have on it I would have made an uninformed (and subsequently wrong) decision on my sink purchase. This letter expresses our appreciation of the sink and faucets that we purchased to compliment our kitchen remodel project. From the start with our search for a copper sink of quality, lead us to locate your web site. We were impressed with the initial product description. The other copper sinks that we had investigated were not made in the U.S.A. In addition, the quality and care did not meet the standards that are represented in your products. We were continued to be impressed upon our initial telephone conversation with you. The description of the process was an integral part of our decision to complete the purchase. We actually did perform the review and make changes in the color of the sink to match the kitchen remodel color scheme. As you can see from the before and after pictures, we continue to be very pleased with the result. 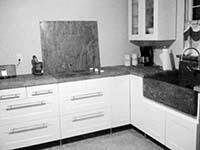 We have already discussed that when we do the next kitchen, we will be purchasing the 48" sink rather than the 36". We love it and are extremely satisfied with the faucets. Please extend our gratitude to your staff who obviously creates your products with care. Also, any inquiry was handled professionally and with concern for timely response. We thank you for making our dream kitchen most enjoyable on a daily basis. Andrea G. and Paul H.